Ask any Civil War relic hunter to name their top two states to recover relics in, and I promise you Virginia will be one of those top two. A while back I had the opportunity to meetup with a Virginia local that claimed he lived right off of General Lee’s retreat route. This route stretches from Petersburg to the Appomattox Court House, which is where Lee surrendered to Grant on April, 9th 1865. He also told me that he was interested in learning how to metal detect. Before heading over to the Virginia I called him up to give him some history on the area. I hopped on google earth and located his house to see exactly where he was located. He truly lived right on one of the main retreat routes! I dug around and managed to locate some old period maps to overlay on google earth. After I finished playing around with my map overlays and doing my research I dropped pins on every piece of property that I believed would hold relics. I told him since he was the local it would be much easier for him to get the permission. I don’t know how many of you have tried gaining permission in Virginia, but let me tell you it isn’t easy, especially when you’re from out of state. Luckily he was able to secure permission to nearly every site I had flagged on google earth. I arrived at my hotel late Friday night and decided to drive by his house and do some scouting from the truck. Instantly I noticed sections of the old period road beds paralleling the current road. I also noticed the Civil War trails signs everywhere, this was truly exciting! The next morning we linked up and discussed a battle plan. The plan was to leap frog along the retreat route hitting as much property in the limited amount of time we had. I explained to him that we needed to walk a pattern over each field. It would limit the time on a piece of property that isn’t producing. The first location was a nice gentle rolling hill that was located close to a water source. With the XP in hand I did a quick ground balance and checked my general search settings I use. I always start out with my general search program and make adjustments that best suit the location I’m detecting. We recovered a couple bullets here and there. The only problem was that there wasn’t a very high concentration of relics. So I walked over to him and said that we can come back to this site but we need to go to the next spot. We were on a time hack, lunch time was rapidly approaching, and I had a good feeling there was something better out there. We jumped into the truck and headed to the next location, which was only a couple minutes down the road. This was a perfect location for soldiers to rest and water their horses. Again we walked our pattern and pulled a few relics out. More bullets and a couple J-hooks that fell off of soldiers ruck sacks, along with a thin gold ring. After we finished our pattern over the field I mentioned that we should keep moving. The fact that we were finding relics was good, but we were not locating pockets of relics that signal a camp. The relics we were recovering were to spread out, suggesting they were dropped during travel. Due to the amount of troop movement that was on this route back in 1865 we should be locating condensed pockets of relics. Not to mention this is Virginia, where relic dreams come true, haha! Once again we were on the move to another location marked on the map. This specific location looked to be the best yet. It was the perfect location for troops to rest. It was a natural bottle neck due to the fact they had to cross a small bridge. With the XP in hand, we began the search. He decided to check the high hill and I went low. Knowing how many miles these troops had to cover. I had a hunch that the last thing those troops wanted to do was climb a big hill just to sit down for a short rest. After roughly ten minutes I began to recover more bullets. But there was something different about this site. All of the relics were in a small area roughly the size of a football field. This is exactly what I was looking for! The site was located right off of the period road bed, there was a water source nearby and the terrain was friendly. The dirt was a nice damp sandy soil mixture, really easy to dig in. There wasn’t much trash and nearly every hole dug produced what we were looking for. The damp conditions helped magnify the target responses. Most of the relics were roughly 11-13” deep in the ground and they were plentiful. My 9” coil was picking up the deep bullets fairly well. Obviously when you are digging small targets down to and past a foot in the ground, your target signals weaken. Having years of experience with this machine I knew what to listen for. Most people assume that the small 9” coil doesn’t have depth but under the right conditions it will detect deep. Knowing that the targets were deep I dropped my reactivity down from 3 to 2, frequency down to 4khz, TX Power 3, and ramped up the sensitivity to the max. Bullet after bullet and j-hook after j-hook came out of the ground. 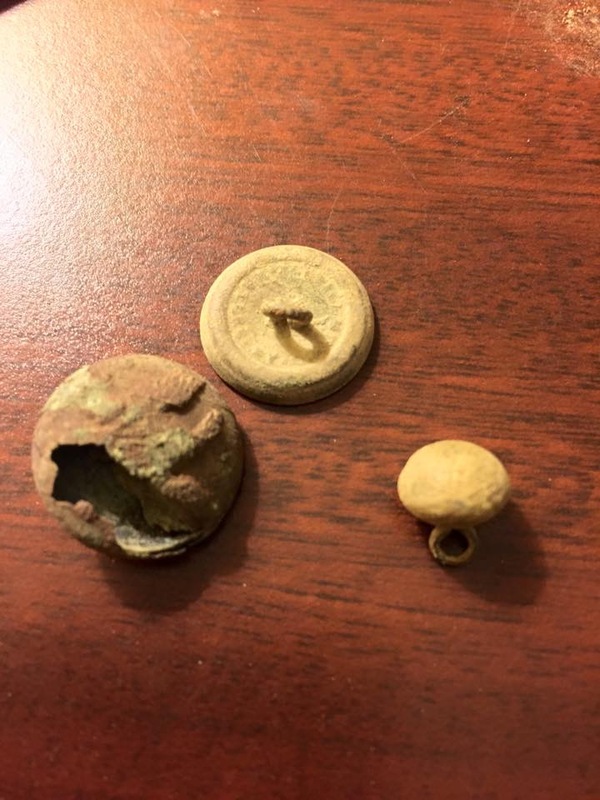 We also found percussion caps, pistol balls and grommets. We were digging fast since we were running out of daylight. After a couple hours passed it was time for a much deserved break. My friend asked to see how many relics I had recovered so far, so I dumped my pouch out on the tailgate of the truck. 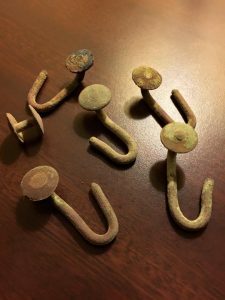 So far I had recovered over fifty bullets, a small army of j-hooks with some other odds and ends. I asked to see how many he had recovered; he replied with not that many. Mind you he wasn’t swinging an XP that day, and he was new to the hobby. That being said he still recovered a very respectable amount of relics for being new to the hobby. After a short water break we were back at it. By now the sun was starting to set and there were still allot of targets left to be uncovered. Minie balls and Williams cleaner bullets were coming out of the ground like prairie dogs at Yellowstone. For those of you that don’t hunt for civil war relics… A Minie ball is a type of muzzle loading bullet that has 3 distinctive rings and a conical base. These are commonly found in a .58 caliber. A Williams cleaner bullet is also is a .58 caliber. It was designed to be fired through the barrel to clean it. 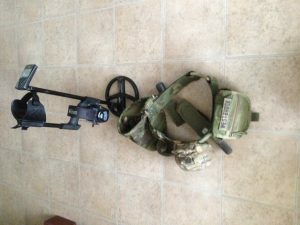 It removes excess black powder build up and lead residue in the barrel. This day had proved to be the best Civil War bullet day I have ever had! 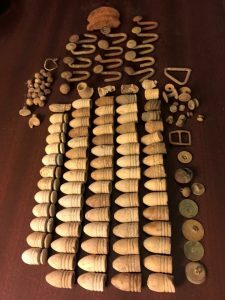 Once it was all said and done I managed to recover over 70 bullets, 13 j-hooks, 7 buttons, a gold ring, and a mixture of percussion caps and hardware. After I returned home my new friend contacted me a few days later and said after witnessing what the XP can do, he was going to purchase one as soon as possible. I told him, “I was going to come back and setup my tent in his back yard, lol.” Ever since then he has been relic hunting with his new XP Deus, utilizing the knowledge I shared with him. He has proven to be a very good relic hunter. I am glad I was able to help him along the way. I’ve said it once and I’ll say it again… Dreams come true when you’re relic hunting in Virginia. Especially when you’re armed with the XP Deus! 5 Responses to "Hunting Lee’s Retreat with the XP Deus By Don Westbrook"
Wow! What a haul! I would love to get into a site like that. Nice write up! Don….just by reading about your Retreat Route experience so far has me chomping at the bit for y’all to get back on that general location! Had to be a camp held by Union Infantry and Cavalry with those water sources being there also……many North and South flocked west from many areas other than Richmond both fleeing and pursuing west right near Amelia they bumped heads! Your research with those transparencies are like having the Rosetta stone! Plus your initial search strategy is highly efficient . I’ve been in and around the Petersburg VA. area all my civilian life and have been an avid Deus user as well. This area has produced some of the most spectacular relics two eyes can handle. This article has me ready to go find a patch of clean woods to dig. Well written Mr. Westbrook!